I am very happy with your service and the cables I ordered. The Price was great compared to other places I looked and I was surprised to see that you had sent free cable ties and a discount voucher. Without a doubt I will be ordering from you again. TOSLINK SPDIF remains a reliable fallback for both stereo and multi-channel audio! Avencore Crystal Series Digital Optical TOSLINK S/PDIF cables offer a high quality interconnect which can't be affected by EMI, RFI or ground-loop interference, making it a potent option for home theatre and studio audio. 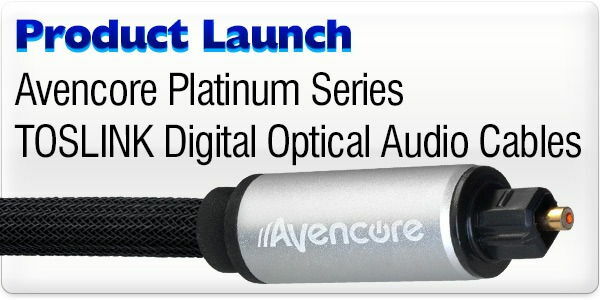 Avencore Crystal Series TOSLINK cables use the same low-attentuation, single-strand optical core as their Platinum Series cable, but package it in a simpler, lighter and easier to manage package. Without bulky nylon braid and tethered boot-caps, Crystal series Toslink cables are easier to transport, route around equipment and fit into existing cable management systems. You still get the same great 192kHz and 24bit audio support, and they work with all the same TOSLINK-compatible home theatre and audio hardware you already have in your home, studio or computer room. They make a great companion to the Avencore Spectre Series Digital Audio converters, too! Hello there, thank you for following up with me. What excellent service! I just wanted to let you know that the TOSLINK cable was received even faster than I anticipated and I am extremely pleased with it. I wasn't able to hear my TV through the surround sound system without it, so when it arrived just so quickly, I was incredibly pleased. I've started telling friends about you as well, if anyone can wait a day or two for delivery, they are going to find MASSIVE savings with your store. Thank you so much for all you do, and I'm sure I'll be back when I realize I need something else! I have recently ordered a set of cables from Cable Chick, to be used for setting up our second home theatre system. This is the second home theatre system I've set up, as well as a home-built PC, using cables ordered from CableChick.com. The cables were of a hight quality for a fraction of the cost of buying the same cables at an electronics store. I was able to get all the cables I needed for the system, from Cable Chick, including 3 HDMI cables, a 3.5mm audio to AV cable, a coaxial cable and a TOSlink cable for around $110, including delivery, which is still less than the rip-off merchants at electronics stores are asking for a single HDMI cable (around $120), and it all came with a free shirt :) The quality of the cable seems to be as good as the cable they were selling at Harvey Norman and Good Guys for $120. The only difference was that the cables I bought did not have protective metal mesh, which we don't need since we have no pets which could chew through the cable, however before we bought the cables with the protective metal mesh and they, and the other cables we bought were still a higher quality and cheaper than the ones sold at Harvey Norman and The Good Guys. We quickly received an invoice through e-mail, as well as updates for the status of our order, which was reassuring that our product was being sent to us soon. The order came in two business days, which is a very timely manner compared to other Australian e-tailers, with all the cables intact, well-packaged and with a free T-shirt included. Very happy with the products and service, will definetely recommend to my friends if they are in need of cables. We had recently purchased a couple of Astro MixAmp headphone amplifiers with Dolby Headphone. These enable listening to surround sound without blasting the neighbours. They have both coax and optical inputs, but our TVs only have optical outputs. Therefore we needed to split the optical output from the TV. The TOSLINK Splitter (Digital Optical Splitter) works perfectly with our latest model Samsung 3D TV (PS58C7000), providing both of us with high fidelity, surround sound, with no crackles or pops. I recently purchased a 2m Digital Fibre Optic TOSLINK to TOSLINK Cable from Cable Chick. I was extremely satisfied with my purchase for a number of reasons. Firstly the shipping time was fast, and the packaging used was above standard. Secondly, I was highly impressed with the quality of the cable at the low price I was charged. This cable would have cost me a lot more in store, even including postage costs. Once I connected the TOSLINK cable into my stereo system, I was blown away by the sound quality and clarity, and it has complemented my system very well. I am also impressed with the customer service I have received including follow-up and daily deal emails. I will definitely buy from Cable Chick again in the future, and I recommend this seller to anyone looking for this type of cable as well as any other. I recently purchased a new Blu-Ray player. Equipped with 3 Blu-Ray discs, I was ready for a good night in when I realized my new purchase had no digital coaxial jack. I wasnt happy. I incorrectly assumed Id have the full connectivity I was used to in my old DVD player. As my Receiver is not HDMI my only option was TOSLINK and I needed a full 10m. Nobody in Ballarat could help with such a long length, so I went on line and quickly found Cable Chick. It arrived in 2 days. I installed it and I am pleased to say that even though it was a budget cable I am enjoying the best sound I have ever heard from my $25 000 home theatre system. Best of all it was really cheap, $42.90 delivered and it has a 5 year warranty. Accordingly I intend to purchase, in the near future, a 10m HDMI cable and a projector ceiling bracket, such was the good and quick service. I may even upgrade all my old RCAs to higher quality too, and I have lots. Before I purchased, I Googled TOSLINK cable specs and found that around 7m is the accepted maximum design length. I found out that newer electronic equipment can often work flawlessly on TOSLINK cable lengths of 30m in this research also. Therefore, before I purchased from Cable Chick I wondered if the cheapest TOSLINK would be up to the task at 10m long as my amp is 9 years old. Well let me assure you that it is. What this means is that if Cable Chick stocks it in long lengths then you can trust it will work. The other thing I like about Cable Chick is that although they stock more expensive cable, they themselves sometimes recommend cheaper cables: Their HDMI cable spec discussion for example. Looking after your customers is always a good idea, but actually doing it as opposed to talking about it, is quite rare. I would recommend all new customers trust Cable Chick to look after you. Avencore have lent their special touch to the standard TOSLINK cable, resulting in a stylish plug which houses a high-quality synthetic optical core, jacketed with matte-finish PVC. A great audio cable for any application! Delivery was super-fast, price was great and the product was exactly what I needed. Easy search and ordering on the website. I'll be back. After purchasing my first Blu-ray player, I was in desperate need of a 10 meter fibre optic cable. Tried various well known outlets in Sydney I couldnt find any fibre optic cable with the right length or price, so I gave Cable Chick.com.au a try. I have to say I was extremely impressed with the delivery time. Highly recommended and I know I will be doing business again with Cable Chick in the future. I purchased a 10m digital TOSLINK to TOSLINK cable. A great product perfect for connecting my PC to my av receiver (which is a very important thing, for gaming and the like). This cable enables my PC to become a media centre. The delivery time was very quick and I live in a obscure country area. I would defiantly recommend this product to others. the Fibre Optic Cables I purchased work very well - these cheaper cables I find are a lot more reliable than the more expensive cables - the more expensive cables lack the very positive 'click' that locks in the cable with the output port on the device - unfortunately the more expensive cables are often loose and simple fall out of the AV equipment they are plugged into. In summary - very happy with the cheaper cables offered by Cable Chick. I bought a 2x 2m Digital Fibre Optic TOSLINK to TOSLINK Cable I was very impressed with the fast delivery and bonous that were sent with my package. I buy all my home theatre cables through you guys as there sooooo overpriced at the retail shops. I'm really impressed with my new Dolby Digital sound via these new cables. Thanks so much for the great business you run. You'll always have my business, that's for sure!